In part one of this series, Blackberry was off to a lead over Android-based phones and the iconic Apple iPhone. So far, we've discussed email, text messaging, apps, calendars, and social networking. In part 2 of this article, we will discuss a few items that won't make most people's list when comparing smartphones. Things like professionalism, focus, productivity, and intangibles. In general, people buy from people they like and, in general, people buy from people who are similar to them. This means that if two people have several things in common, they have an increased chance of "liking" one another compared to two people who don't have many things in common. Salespeople often try to build rapport with their customer through identifying areas of prospect/customer interest that they have experience with. Sometimes, finding a rapport-building conversation is challenging and sales people feel forced to come up with something. Before asking about the weather, sales professionals in the tech field often look for electronic devices to spark a conversation. The smartphone attached to a customer's belt or sitting on the desk is an often used conversation starter. While this may seem like a stretch, realize that many people are passionate about their devices, including their smartphones. Numerous conversations have been centered around a specific app, smartphone game or how the newest operating system or phone model compares with others. Apple has the most passionate and loyal customers, giving the iPhone the point for an increased ability to start a rapport-building conversation around. Having a healthy work-life balance is critical for most to maintain long-term success. If all that is thought of work, your personal life will, inevitably, suffer. With Internet access, apps designed to do anything and everything from kill a few pigs by launching kamikaze birds to making dinner reservations for your significant others birthday, all three smartphones can deliver. However, Blackberry's presentation of their apps and their lack of app availability really turns many people away. Both the iPhone and Android have an astounding number of apps and the number of their apps continue to grow every day. While as of the writing of this article Apple has more apps, both the iPhone and Android earn a point in this category. This article's focus is not on which phone is an all-around more equipped and capable smartphone, but which smartphone is best suited for sales professionals. Breaking the tie is which smartphone offers fewer distractions and Blackberry wins due to a recognized weakness. iPhones and Androids have an incredible number of non-business focused apps available for download. Once installed, a sales professional is but a few finger swipes away from playing Angry Birds, Cut the Rope and a thousand other games. The sales rep can easily check the score of the Yankees game, grab a recipe or check how their eBay auction is going. While a wide variety of apps is a strength, it is also a weakness for the iPhone and Android-based smartphones. 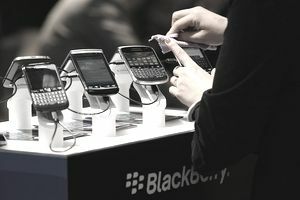 Blackberry phones are more like business tools than are the other contenders. Their simplicity and lack of available distractions are powerful omissions that not only keep network administrators happy but remove potential distractions in a sales professionals day. For those sales reps with the discipline and focus that keeps them from the temptation of playing a quick video game instead of making a cold call, the best smartphone for them is largely a matter of taste. All three are great phones. But for a sales professional who needs a tool that is designed to assist them in their day to day business activities and is not designed to provide easy access to distractions, Blackberry is the best choice.